A while ago I signed up to do a Christmas SAL from a blog I read. Carole (whose blog it is) put the colours as either blue or multicoloured. I was going to do it in blue but then changed my mind after I decided to stitch it for my daughter Darcy. Darcy had her first christmas last year but it didn't go well at all. First my grandad was in hospital (he died between Christmas and New Years), our youngest son Luke was very ill over the period and on Boxing Day I fell in the carpark of Sheffield Children's Hospital and broke my hand...didn't know this until 10days later when I finally went to Casualty to have it checked out! So poor Darcy didn't have the best time, I've decided that this year as she's nearly 2 we'll pull out all the stops for her. This SAL i've done in shades of purple and in the circles am going to put her name and this years date. Then it can be hung up for her. That's really pretty, Jo. And my 2 cents say that she will know more about what's going on this year at Christmas, anyway! It looks lovely! Good news is she won't remember how hard Christmas was last year. Hope everything goes much better this time around. 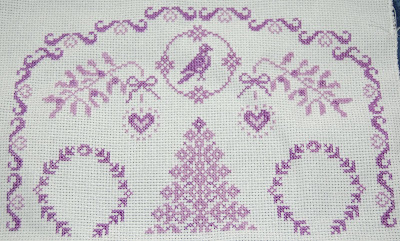 Jo... your Christmas SAL is lovely in the purples, I am sure that Darcy will treasure it in years to come.Here is hoping Christmas time will be a much better time this year for you and your family. Jo, this is going to be so pretty! The shades of purple are some of my favorite and I know Darcy is going to love it and treasure it forever. And I want to wish for you early on one of the best Christmas's your family has ever had this year. On my blog your pic is a red x now...is it because you changed your profile pic? Sorry about your hand, hope it's better. So sorry about your Grand Dad, and son Luke too. Hope all is well there. This year will be better for Darcy. Love your picture at the start of your blog. It reminds me of Cape Town, South Africa where my daughter lives. The ocean is so peaceful isn't it? Your stitching for your daughter is quite beautiful she will love it and indeed cherish it forever. I like the purple.